Basically, male goats (billies) have thicker horns with large bases, they taper gradually to a point and generally sweep back in a more uniformed arc. If you see a goat where the bases seem to touch, this is typically a billy. Nannies have more slender horns however they are oftentimes very long - sometimes much longer then billy horns. They tend to flare out when looking straight on and from the profile they seem to hook near the end. Nannies urinate in a squatting position while an adult billy urinates by stretching. However, we were fooled once by a nice billy goat which squatted to defecate. From a distance it looked like he was urinating. Many people look for a stained rump which often indicates a billy. While this may be the rule in some places, all the goats here were filthy from dust baths and we found this trait unreliable when tying to identify gender. 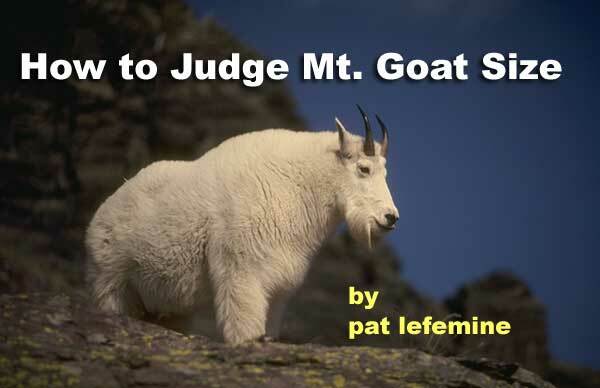 Generally, a billy goat is much larger than a female. Also, billies tend to be loners and are rarely seen with kids. If you spot what you think is a billy, and there is a kid tagging close by, it is best not to shoot as it is probably a nanny. Also, billies tend to grow hair sooner than nannies and they have a more pronounced hump. Pictures courtesy of the Alaska Department of Fish and Game.